Inflation of a Mooney-Rivlin hyperelastic balloon. This example serves as a verification of the membrane term (dw_tl_membrane, TLMembraneTerm) implementation. where , are the Mooney-Rivlin material parameters. In the equations below, only the surface of the domain is mechanically important - a stiff 2D membrane is embedded in the 3D space and coincides with the balloon surface. The volume is very soft, to simulate a fluid-filled cavity. A similar model could be used to model e.g. plant cells. The balloon surface is loaded by prescribing the inner volume change . The fluid pressure in the cavity is a single scalar value, enforced by the 'integral_mean_value' linear combination condition. The and variables correspond to , , respectively, transformed to the membrane coordinate frame. The agreement should be very good, even though the mesh is coarse. where :math:`c_1`, :math:`c_2` are the Mooney-Rivlin material parameters. surface is loaded by prescribing the inner volume change :math:`\omega(t)`. Get relative volume V/V0 from relative stretch r/r0  of a ball. 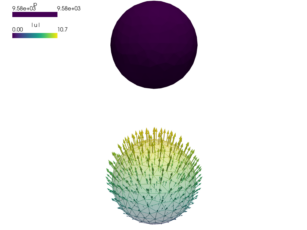 Get relative stretch r/r0 from relative volume V/V0 of a ball.